A formal composition with three seated figures inside a room in the foreground, behind which three arches open to gardens in the middle distance. Beyond those gardens is the landscape of a city, divided in two by a river running vertically up the view into rolling hills in the far distance, and a diffusely bright sky. 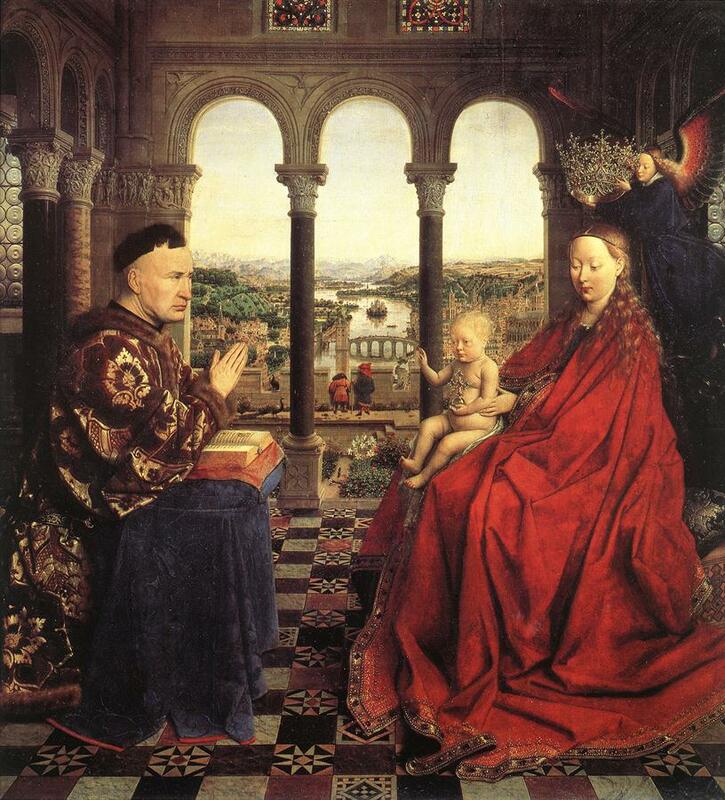 On the left is Chancellor Rolin, looking earnestly at the Madonna and Child opposite. His hands are held up in prayer, below them an illuminated book (presumably a Book of Hours) resting on scarlet material, in turn on a support covered in rich, dark blue fabric. His head is bare, his hair cut short in austere, monastic form. He wears a full-length fur-trimmed cloak elaborately decorated in metalled embroidery over mid-brown material. On the right is the Madonna, the Christ Child sat on her right knee. Her glance is downward and her head bare, revealing shimmering hair flowing over her shoulders. Immediately above her head a winged angel bears a crown, poised to be placed on the Madonna’s head. She is enveloped to the mid-neck in a floor-length, flowing bright red gown, its edges decorated with metals and jewels. The naked Child holds a polished crystal orb with jeweled crucifix in his left hand, and his right hand is held up in blessing. The room has an elaborate geometrically-patterned tiled floor and four polished stone pillars are visible internally behind the adult figures, with glimpses of glass windows at the extreme left and right edges, and two stained glass windows at the top of the painting. The room thus appears to be the Italianate loggia of a palace. The heads of each pillar are decorated with reliefs showing Biblical scenes. 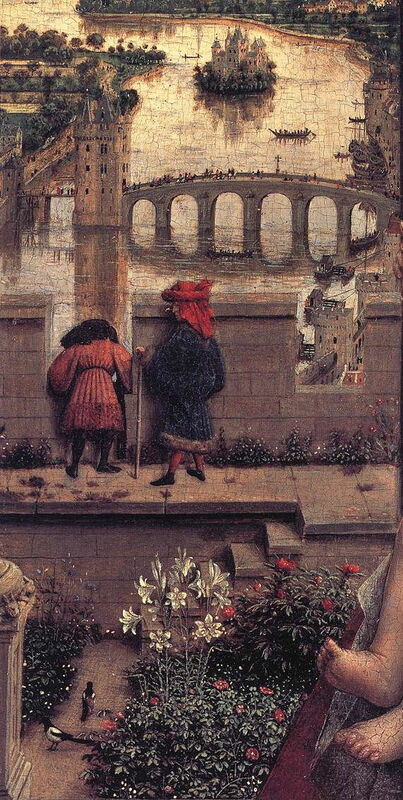 The garden in the middle distance ends in a crenellated castle wall, against which two figures, their backs to the viewer, face towards the river below them. The garden is rich in symbolic animals, birds, and plants, including rabbits, magpies, peacocks, lilies, irises, peonies, and roses. The city and river behind are shown in fine detail. The left bank rises behind buildings to grassy and wooded hills. The right bank contains the grand buildings of a major city of the day, behind which is a plateau of fields and small woods. In the river is a built-up island, a bridge, and a boat containing several occupants. The water is glassy calm and detailed reflections of the buildings, bridge, boat and its occupants are shown on the surface of the water. The far distant rolling hills fade into bright haze at the horizon. The whole painting is remarkable for its rich textures and its depiction of the effects of light on surfaces. Skin of faces and hands are finely detailed and reflect the age of the person. The landscape behind is shown in exquisitely fine detail, with meticulous attention to the rendering of the effects of light and reflections on the river. There is also great depth in the painting, giving the impression of a vividly three-dimensional scene. Indeed if one word was to summarise this work it has to be vivid. Jan van Eyck’s life is not well documented, and we do not have definite dates for his birth or death. It is thought that he was born in Maaseik, in the modern province of Limburg on the border of Belgium and the Netherlands, between 1380 and 1390. He was already a Master with his own workshop when he worked in the Hague in about 1422. In 1425 he became court painter to Philip the Good, Duke of Burgundy, working at first in Lille before moving to Bruges in 1429, where his workshop remained for the rest of his life. In addition to painting commissioned works, for which he was highly regarded and well paid, he undertook several diplomatic missions for the Duke, including arranging the Duke’s marriage with Isabella of Portugal. Working in oils on wood panels, he was a great influence on other painters in the Northern Renaissance, including Robert Campin and Rogier van der Weyden, who also adopted a detailed realistic style which spread later throughout northern Europe. He died on or before 9 July 1441, leaving his brother to run his workshop. Although Vasari was incorrect to credit van Eyck with the invention of oil painting, he was certainly one of its earliest and greatest exponents. The Northern Renaissance is currently eclipsed by that of the South (centred on Italy), but in many ways at the time it was the more innovative and ultimately more influential. Gombrich has described how, whilst the painters of Italy were getting to grips with linear perspective following Brunelleschi’s lead, those in what is now Belgium and the Netherlands were engaged in the development of oil paints, and their use to portray very realistic surface textures and optical properties. Egg tempera, the mainstay medium in the South, dries very quickly and is difficult to use to render surface textures realistically. As the painters of both North and South moved away from the symbolic, icon-like religious works of the past, becoming more realistic, they came to appreciate the advantages of oil paints, which dry much more slowly; in doing so, oils were found to be far better suited to subtle techniques, for instance to render surface textures, sheen, reflections, and transparency. With the earlier introduction and development of oil paints in the North, van Eyck’s paintings attest to those remarkable properties, and to his skills in exploiting them. Jan van Eyck, Portrait of Giovanni(?) Arnolfini and his Wife (1434), oil on oak panel, 82.2 x 60 cm. National Gallery, London (WikiArt). 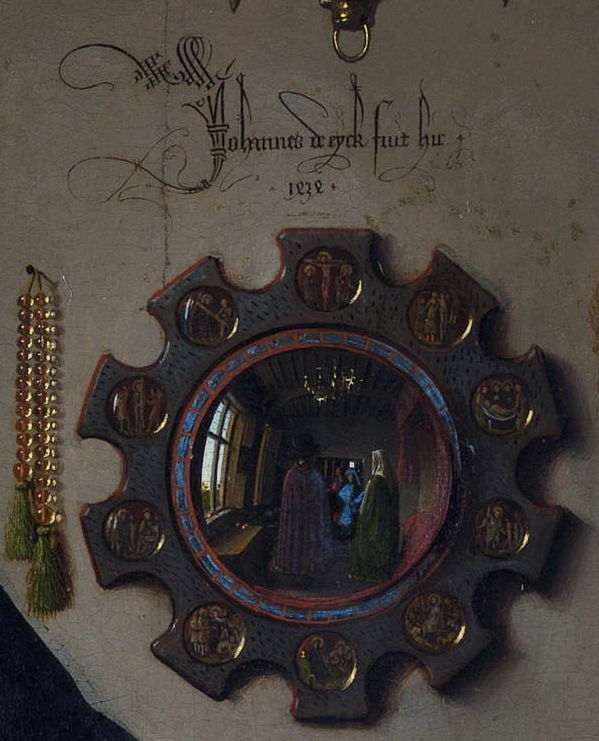 Van Eyck’s most famous painting, known as The Arnolfini Wedding (or similar variations), was a remarkable exploration of optics, featuring distorted reflections in the mirror near the centre of the painting; it was completed in the previous year, 1434. Following that he and the team in his workshop moved on to this, probably the most ambitious early work, to extend their exploration of surface textures. 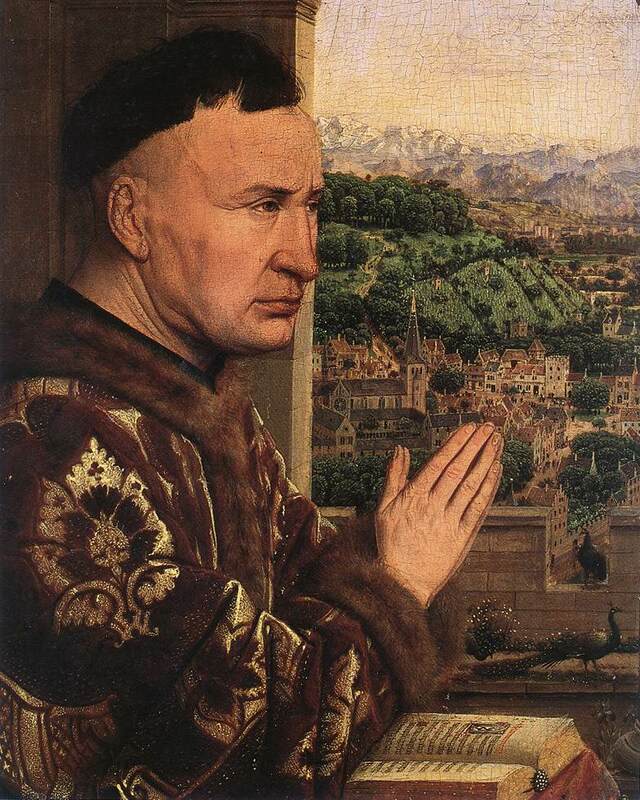 Chancellor Rolin, leading civil servant to the Duke of Burgundy, probably commissioned this unusual combination of portrait and religious painting, showing him as a pious and devoted servant of God (Harbison discusses possible interpretation at length). At the time of this painting, he was probably 59 years old, and clearly in uncommonly good health for that age, perhaps as a result of the great estates and other wealth which he had amassed. It is also worth bearing in mind that, when this work was painted, even the affluent lived in a world which was almost devoid of images, by comparison with ours. Dürer’s woodcuts, the first mass-produced graphic images, did not appear until the end of that century, and photography was not invented for a further 400 years. Such realistic and detailed paintings as this would have been exceptional marvels, inducing people to travel far to view them. Despite modern controversies over the importance or relevance of perspective and other methods of portraying a three-dimensional world in a two-dimensional image, this painting is evidence that the first great realist painters employed the same techniques as a realist painter would today. Jan van Eyck, Portrait of Giovanni(?) Arnolfini and his Wife (detail) (1434), oil on oak panel, 82.2 x 60 cm. National Gallery, London (WikiArt). 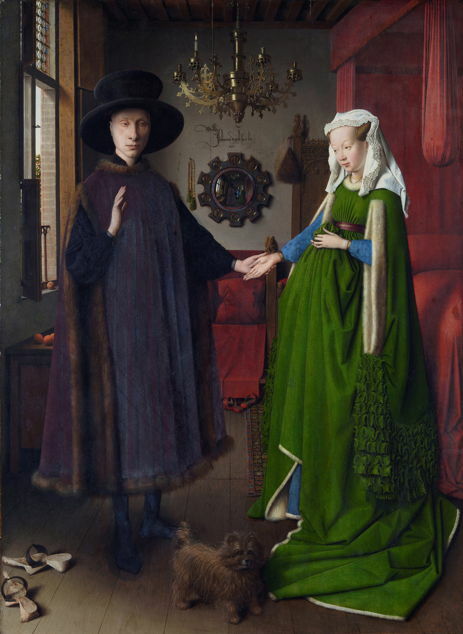 David Hockney and others have claimed that van Eyck used the camera obscura to paint some or all of The Arnolfini Wedding. Although that has been disputed for a number of reasons, and it is feasible that he could have used one to paint the foreground of this work, the intricate detail and reflections in the background landscape – surely the greatest challenge in terms of drawing – could hardly have been painted using a camera obscura. This painting shows how skilled the early adopters of oil paints had become, both in the subtle rendering of surface texture and properties, and in showing fine detail. Oils were to sweep across Europe as the medium of choice for major paintings made over the next 550 years or so, although the wooden panel was to decline steadily in popularity, in favour of stretched fabrics such as linen. Others (see the references below) have explained the history, social setting, symbolics, and other aspects of this painting. One important fact that appears to have escaped previous attention is that it is one of the first paintings to depict reflections on water realistically. Prior to about 1400, all Western paintings had shown water symbolically, coloured blue and with wavy lines, and that has persisted in traditional Asian painting. Painters of the Northern Renaissance appear to have been the first to attempt to paint water as it actually appears, complete with waves and reflections. Jan van Eyck, Saint Francis of Assisi Receiving the Stigmata (detail) (1430-2) oil on panel, 29.3 x 33.4 cm. Galleria Sabauda, Turin (WikiArt). 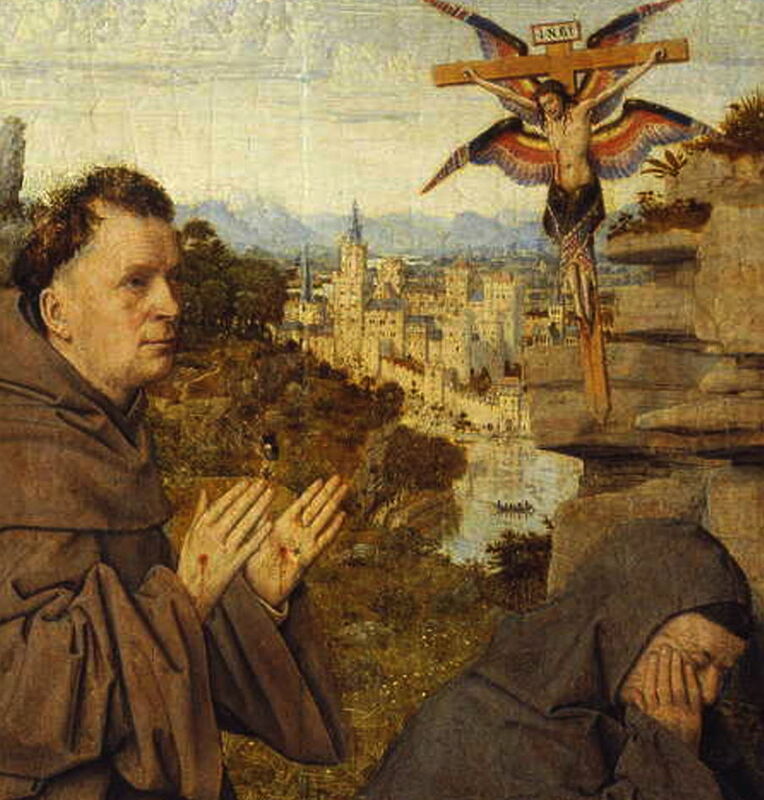 Van Eyck’s earlier painting, Saint Francis of Assisi Receiving the Stigmata (1430-2), may be the earliest full-scale painting in which reflections are depicted faithfully, and contemporary works by Rogier van der Weyden from his Saint George and the Dragon (1432-5) were similarly innovative. However it is more likely that Robert Campin’s Nativity (1420-35) and paintings in Books of Hours stole the lead over van Eyck. The earliest works from the Southern Renaissance which show detailed reflections on water are probably those of Piero della Francesca, such as The Baptism of Christ and The Penance of Saint Jerome (both 1450). It was not until the end of the century that faithful depictions of reflection on water became more commonplace in the North and South. Unlike The Arnolfini Wedding, The Rolin Madonna employs the increasingly popular device of a landscape background, which features in so many paintings of the Northern Renaissance. At that time, landscape painting had not become a practice or genre in Europe, but these cameo landscapes laid the ground for the later production of pure landscape paintings. To my eye, this is one of the most important and wonderful paintings in Western art, and alone justifies a visit to the Louvre. Alain Jaubert, Palettes DVD: Mystères sacrés, Miracle dans la loggia, Editions Montparnasse. (A complete 26 minute programme in this superb series, featuring this painting.) Details. Posted in Painting and tagged painting, realism, renaissance, Rolin Madonna, van Eyck. Bookmark the permalink.